This article was sponsored by Insightly. Thank you for supporting the sponsors that make SitePoint possible. Customer Relationshop Management (CRM) is essential when running a business. With a large number of customers, you need to be able to properly track communications for sales quotes, projects and so on. When you’re involved in sales, you’re probably going to be on the move when a prospective client reaches out to you. When working with potential customer you want to keep them as “warm” as possible; you don’t want to waste any time in getting back to your office first to browse though your conversation history or quotes. Say hello to mobile CRM. When using a proper tool for managing your contacts you can do it all from your phone or tablet. In this article I’ll take a look at how a mobile CRM can benefit your business, looking specifically at Insightly’s tools. They offer both a free plan and a 14 day free trial of their premium plan so you can try it out yourself right away. Why would you need a mobile CRM? Imagine this: You’re out on the road, and a prospect you’ve been negotiating with for months calls. They want to close the deal on your product, but they want a quick rundown on the various options you offered them, just to be sure. You know you agreed a certain discount with them, but you’ve forgotten the specific amount. You also pitched them a cross-sell to your product, but you’re not sure which one. What you do know is that you have it all stored in the prospect’s file. But your office is miles away, and the client wants to close right now. You suddenly remember you recently installed a CRM app on your phone. You tell the prospect you’ll call him back in five minutes, and open the app. You check the prospect’s file, check for discount and cross-sell details and call them back. You put your client on the phone’s speaker, and quickly and calmly walk him through all the details. The client is impressed with your professionalism and happily agrees to buy both your initial product as well as the cross-sell offer. You thank your client for doing business with you, move their state from “open” to “won” in the CRM app, and drive home satisfied. Because you don’t need to waste any time at the office, you can relax and take your spouse for dinner to celebrate. It’s pretty clear how a mobile CRM can benefit you and your business. Let’s see how it works. Setting up a mobile CRM for your company is easy when you start using Insightly. As mentioned above, they offer both a free plan and a free trial for their paid plan. The free plan is limited to three users and 2500 records, without custom branding, Google Calendar and Contact sync or MailChimp integration. If you’re already using Google Apps I’d advise you to consider the paid plan, since the integration options are quite useful. All plans offer features like Contact, Project, Lead and Task management, all covered with automatic backups, better than decent encryption and unlimited support. And there’s of course mobile access with an app for both iOs and Android. For this article I am using the Android app, on a Galaxy Note 3. To start you need to sign up for a free account or a free 14-day trial. 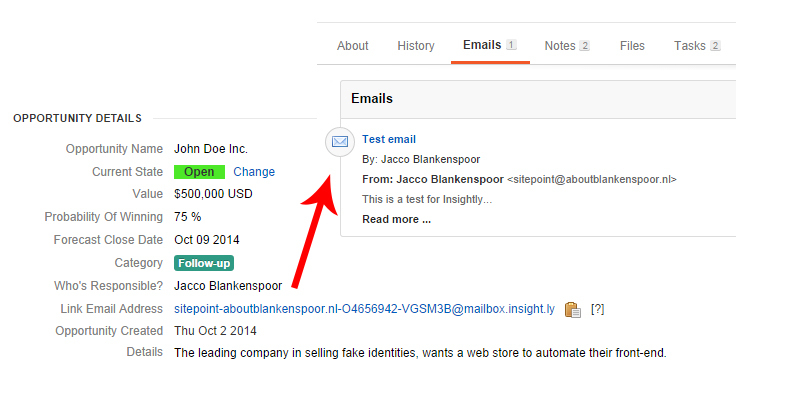 After entering a few details about you and your business, hit the “Next” button. 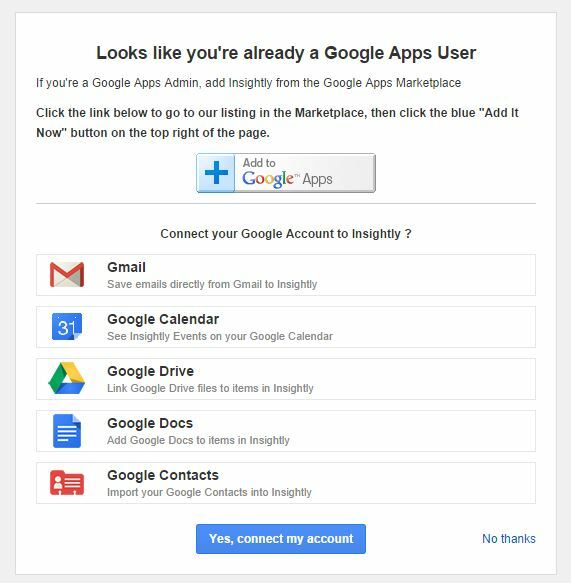 If your account is also used for Google Apps you’ll get the option to connect your Google Account to Insightly right away, in both the free and paid plans. It’s best to make your choice early because once you’ve decided, you can’t easily change to the other option. If you need some advice, Insightly’s helpdesk has detailed rundown of the pros and cons. Add to Google Apps: This allows you to use the Gmail gadget for easily adding email conversations to Insightly with a drop-down menu. Yes, connect my account: This gives you automated sync with Google Drive, and on the paid plans also Contact and Calendar sync. No thanks: This skips the Google Apps integration, but you won’t be able to change it afterwards, as mentioned before. Categories: Type of contact, like phone or email. Stages: Steps in your pipeline, like warming up the lead, discussing prices. Activity sets: Group of activities within a stage, like cold-calling or meeting up. Activities: Specific tasks or events. This might seem like a lot of work, but it helps you in keeping things organized later on. So be sure to take your time for setting these up. Let’s see how this looks in my demo setup. You can add these values yourself by selecting “System settings” in the right-hard corner on top. Once this is all set and done (my example is a bit more simple than a real pipeline), you can go and create a new prospect, called an “Opportunity”. Now let’s make it really interesting and dive into the mobile app to see how that works. As you can see, all the prospect’s details are there, along with some additional notes I made inside the app. It’s very easy to add notes like “discussed discounts” or “discussed cross-sells” from within the app. You can also close tasks you performed, or add comments. 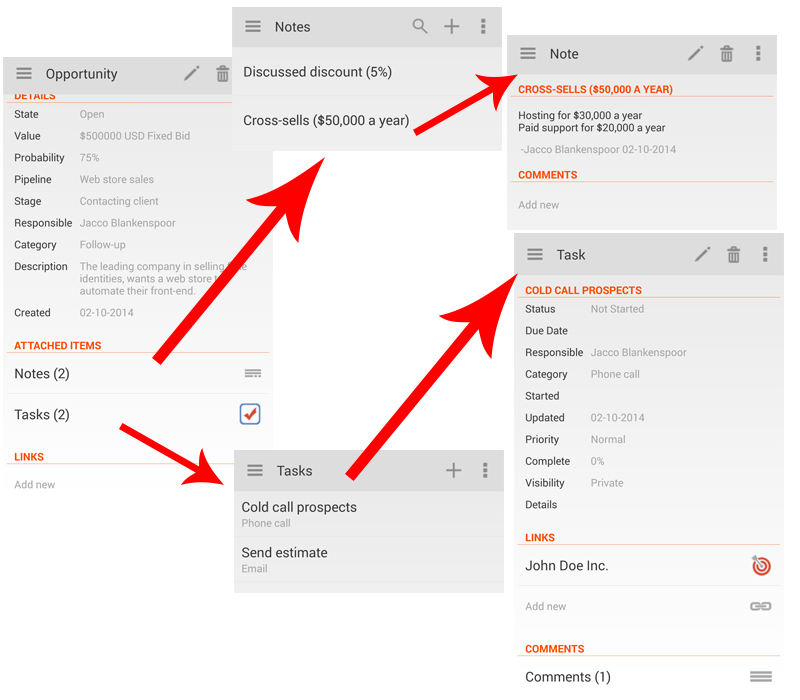 It’s also possible to change opportunity details in the app, like bid amount or probability of closing the deal. Perhaps the most fun and rewarding detail you can change is the state, when you transform your lead from “Open” into “Won”, after which it’s dinner time! Insightly comes with a whole range of advanced features which are included in all plans. I’ll highlight a few. Insightly lets you keep track of your sales funnel, with reports at all stages. 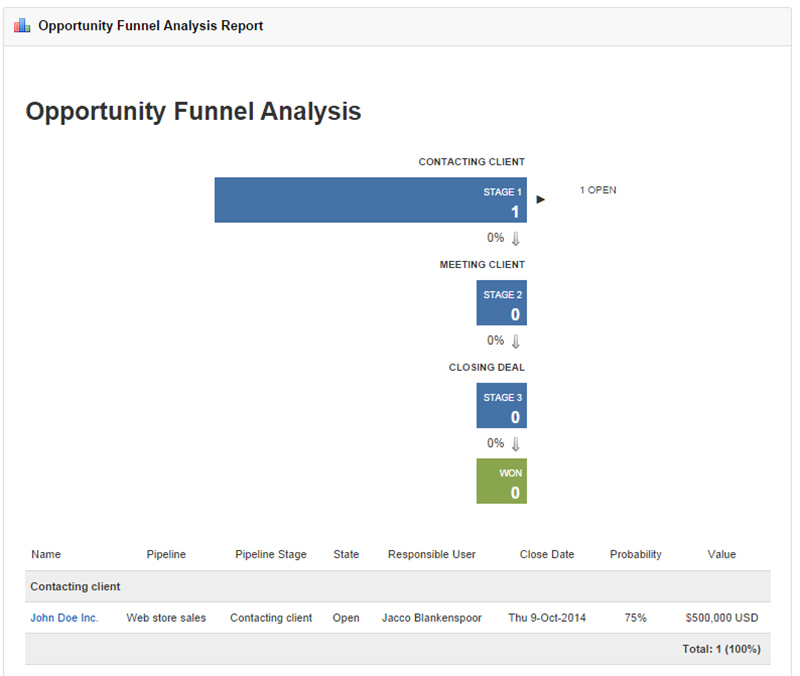 One report that I found especially impressive is the “Opportunity Funnel Analysis”. This report is based on the values I’ve configured before (see “Setting up Insightly”). The funnel stages you entered are displayed visually, including the number of prospects in each stage. Web-to-contact is an easily overlooked feature that is actually very powerful. It allows you to set up a web based form to capture contact information on your site, and import in into Insightly as a Contact right away. 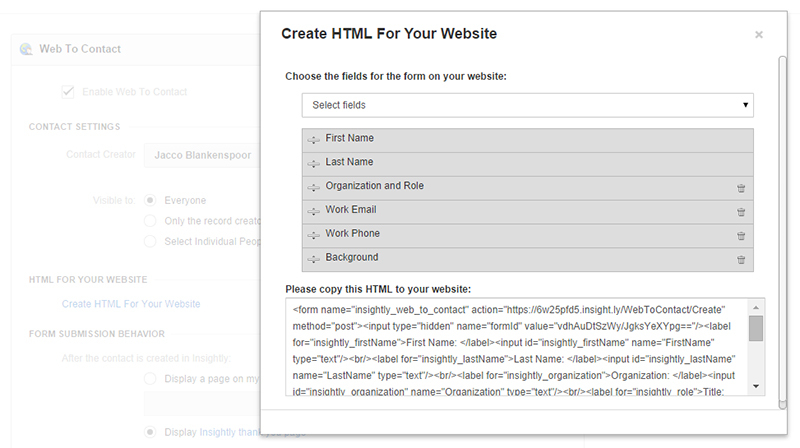 It even generates the required HTML code for you. 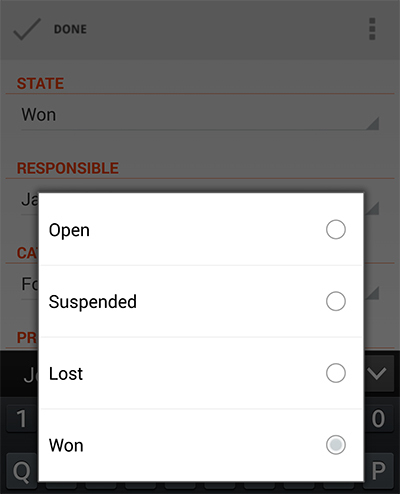 You can also set up selected users to receive these contacts for proper follow-up. 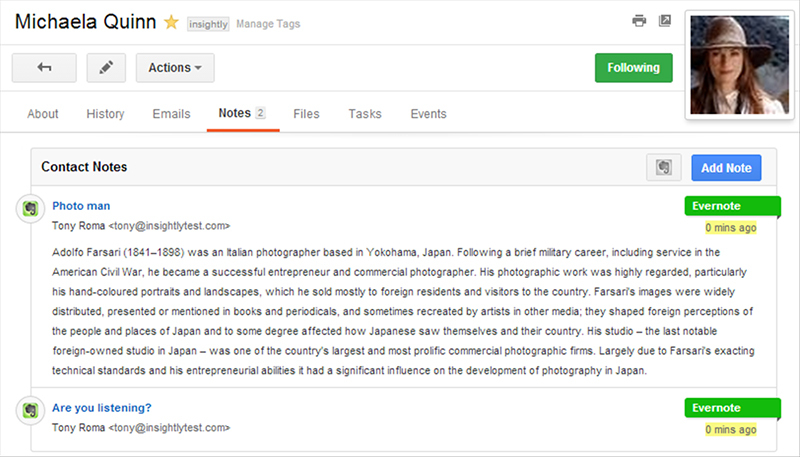 I personally love Evernote and use it constantly to organize my ideas, research or products links. Insightly lets you link your Evernote account so you can import you Evernote items in a very convenient way. Just select which items you want to connect to a Contact and they are displayed along with your regular notes. Insightly is not only perfect for managing prospective customers, but also for managing your current customers. Using the same basic principles as the “Opportunity” section, you can set up pipelines, tasks and notes for customers and their projects. 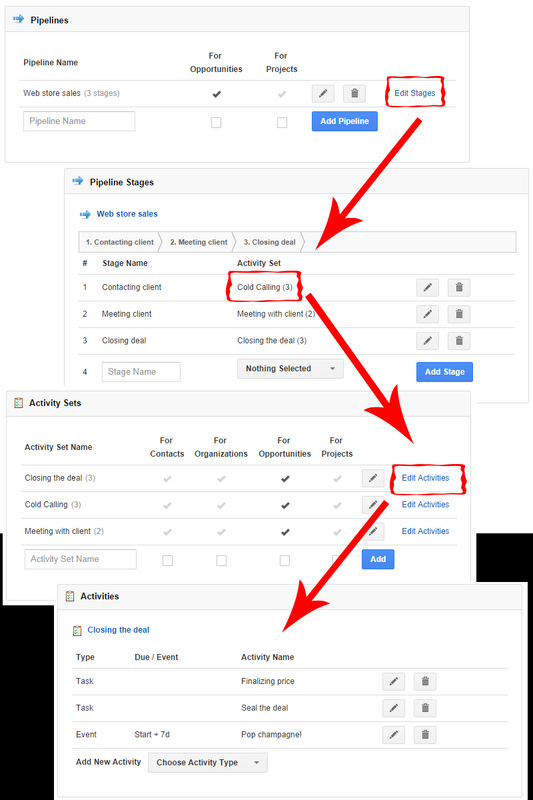 You can build detailed pipelines for managing a project, or use your prospect sales funnel on current customers. For the latter, you only need to select one simple checkbox to enable it, which is an enormous time saver. It also allows for uniform reporting. 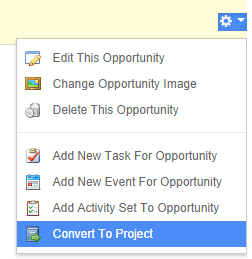 To make it even more convenient you can simply change an “Opportunity” into a “Project” and keep all of its contact history and customer information. Insightly provides a unique email address for your general account, and another for each customer/prospect. Everything you send to this email address is connected in Insightly, so you can use it to forward mails to or as a CC/BCC address. You can also give it to you client so they know their emails are saved properly. Combined with automatic backups, this is a surefire way of never risking to lose you conversation history. Insightly is an incredibly versatile system for managing both your prospects and your customers. Its mobile CRM app allows mobile workers to have access to all their important client data on the move, and keep HQ updated of all their activities. 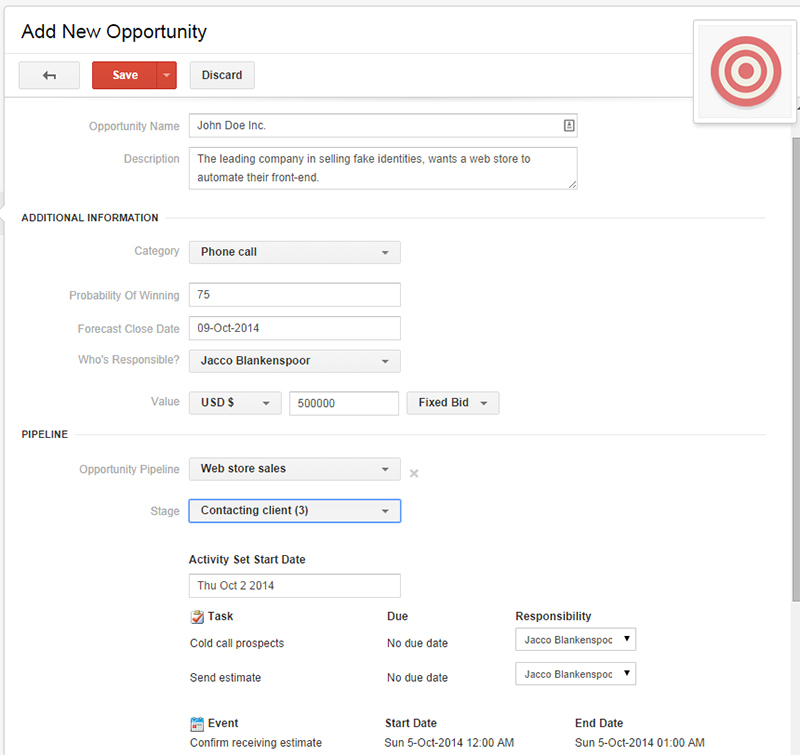 It also has more features and integrations than most CRM tools, even in its free plan. But the pricing for the paid plan’s pricing is very fair, starting at $7 per month (when paid annually). For more information on Insightly, check out their resources page, which includes a ‘Getting Started’ guide in PDF format. Have you had experience with CRMs? What are your top tips for managing customers on the go?